Pakistani cleric Tahir ul-Qadri ended his protest in Islamabad. After over two months of siege on the nation’s capital, Pakistani anti-government cleric Tahir ul-Qadri told his supporters that the sit-in in Islamabad is at an end. Both Qadri and Imran Khan, leader of the Pakistan Tehreek-e-Insaaf (PTI) and a former cricket star, staged an anti-government demonstrated in Islamabad in mid-August to protest Prime Minister Nawaz Sharif’s government. Both men argued that Sharif’s victory in Pakistan’s elections last year was fraudulent. Speaking to his supporters in Islamabad on Tuesday, Qadri told his supporters that the “sit-in has achieved its purpose, it has awakened the nation and played its role in the path of revolution.” According to the AP, Khan and his protesters maintain that they will remain in Islamabad to protest until Sharif resigns. Despite the continuance of the protests over the past month, they have received significantly less attention and Sharif’s government has found itself somewhat more capable of governing out of Islamabad. In the early phase of the government, Islamabad’s government buildings were under siege. Sharif called in the Pakistani military to secure the city’s “red zone” — the area containing major government buildings — from the protesters. Qadri has said that he will take his protest to other cities in Pakistan, in an attempt to nationalize his cause. Qadri and Khan began their siege on Islamabad on August 14 — Pakistan’s independence day. Khan dubbed the initial march on Islamabad an “Azadi March” (azadi meaning “freedom” or “independence” in Urdu). 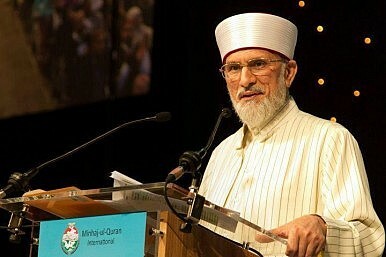 Qadri heavily emphasized that the next step was to spread what he called a “revolution” across all of Pakistan. “I advise all supporters that they continue to work hard to spread the revolutionary movement around the country,” he told his supporters. Nawaz Sharif Chairs Emergency Parliament Session as Crisis WorsensIs There a Crisis in Pakistan?Pakistan’s Economic Woes: The Way ForwardWhy the Pakistani Establishment Is Rooting for the BJPShould Pakistan PM Imran Khan Expect a Major Opposition Party Challenge Soon?